I have been enjoying the beauty of wine for a couple of decades. However, my knowledge and taste buds regarding French wine are lacking. Therefore, I have made this my summer of French wine. To begin my journey into the world of French wine I sought out the knowledge and expertise of a few Twitter friends to lead the way. As expected I received excellent advice: focus on one region at a time; find a French wine expert at a local wine retailer to guide my selections; and read as much as possible on French wine from sources such as French Wine Society, Wine Folly, Total Wine and The Wine Bible. 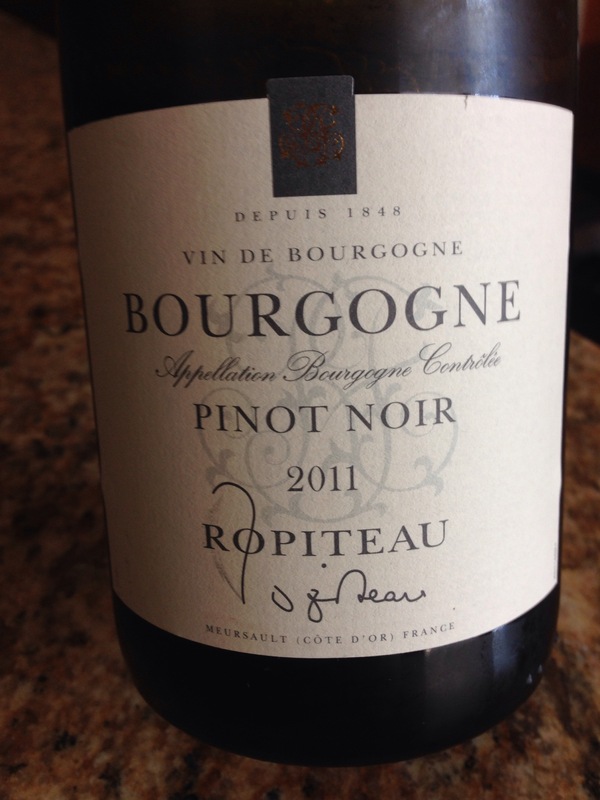 Ropiteau Bourgogne 2011 Pinot Noir: This lovely ruby Pinot Noir met the nose with a pleasing aroma of cherries and minerals; it followed on the palate with an elegant mineral earthiness accompanied by bright cherries, red currants, mushrooms and baking spices. It was a medium body wine, with low to medium acidity and a medium finish. This wine was markedly different than the many dozens of US, notably west coast, Pinot Noirs I have enjoyed in my life. I was told to expect a heavier influence of terroir over fruit; that was exactly what this wine offered. Ropiteau 2011 Pinot Noir comes from the Burgundy region with a Regionales classification. I thoroughly enjoyed it and recommend you buy some for yourself! SRP $17.99 at Total Wine. 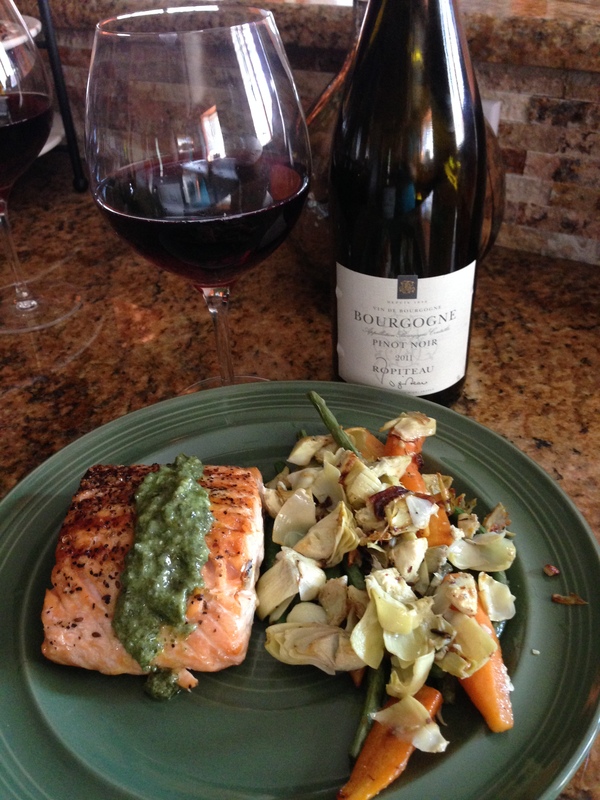 I paired this lovely Ropiteau Pinot Noir with salmon I seared in a grill pan on the stove then baked in the oven for 20 minutes before topping with a basil, pine nut pesto sauce accompanied with sautéed vegetables of artichoke hearts, baby carrots, haricot verts, shallots and garlic in extra virgin olive oil. It was a light and refreshing dinner that paired very well with this light and refreshing Pinot Noir. Furthermore, this Pinot Noir would pair well with roasted pork tenderloin, leek and broccoli frittata, summer creamy asparagus soup and rotisserie chicken. 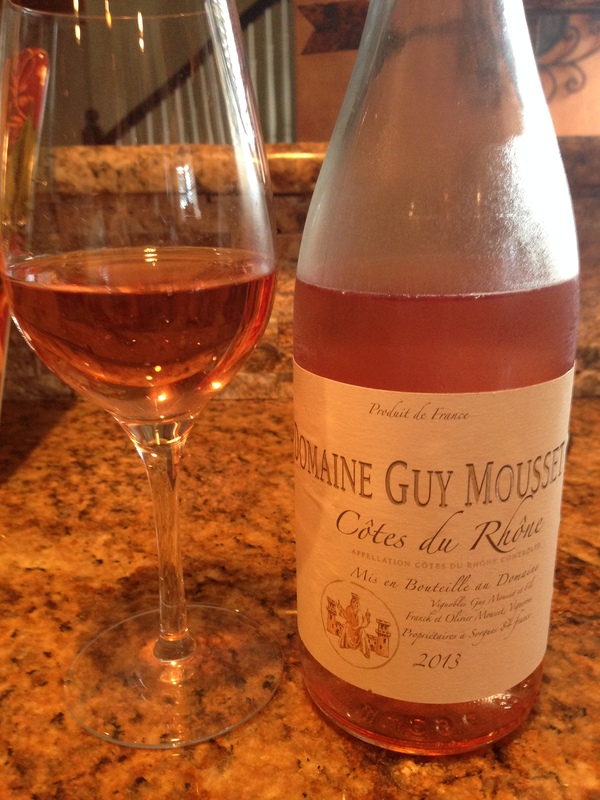 Domaine Guy Mousset Côtes du Rhône 2013 Rose: This delightful rose was a soft salmon color. The inviting bouquet was fresh picked ripe strawberries and cherries. On the palate it pleased with refreshing flavors of strawberries, cherries and rose petals, with a slight minerality on the back of the palate. Comprised mostly of Grenache (with probably some Syrah and Mourvedre), this rose was medium body with well balanced acidity making it perfect to sip on a warm evening or pair perfectly with summer food. 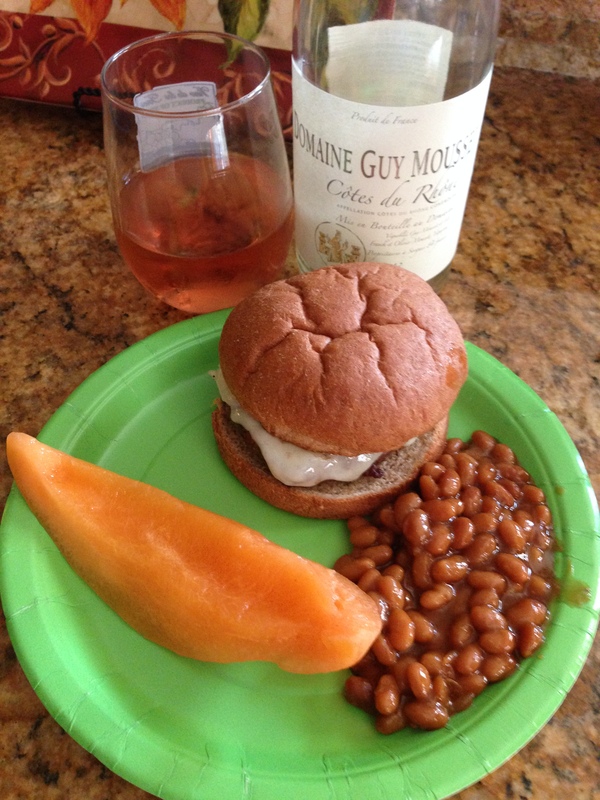 I paired this rose with a typical summer weeknight meal of grilled hamburger with melted havarti, baked beans and fresh sliced cantaloupe. The dryness of the rose was the perfect pairing with the sweetness of the baked beans and cantaloupe. Furthermore, we enjoyed a glass of the Domaine Guy Mousset 2013 Rose by itself one evening before attending a party. It made for enjoyable summer sippin. Other food pairing recommendations include a summer salad with grilled steak, strawberries and gorgonzola cheese with balsamic vinaigrette, turkey or veggie burgers or barbeque. I enjoyed this rose very much; I recommend you purchase a few bottles for summer fun. SRP $12.99 at Total Wine. My song selections: The song I have chosen to pair with Ropiteau Bourgogne 2011 Pinot Noir is Tell Me a Tale by Michael Kiwanuka. As an artist he is fresh and crisp and offers a refreshing break from the everyday radio scene. Tell Me a Tale is an eclectic song; blending traditional sounds from a variety of musical genres with a modern hipness that captures attention. The same can be said for the Ropiteau 2011Pinot Noir. It is refreshing and different, pleasing to the palate and the nose, easy to drink and thoroughly enjoyable; an alternative yet highly accessible to all. The song I have chosen to pair with Domaine Guy Mousset Côtes du Rhône 2013 Rose is Happy by Pharrell Williams. Everybody by now knows this song. Not only is the song entitled Happy; it creates happiness each time it is heard. The same is said for the Domaine Guy Mousset Rose. This wine puts a smile on the face of the drinker due to its pleasing aroma and taste. Get your own bottles of Ropiteau Bourgogne 2011 Pinot Noir and Domaine Guy Mousset Cotes du Rhone 2013 Rose and let me know what songs you would pair with them. Cheers! I really enjoy French wines, especially the French Rose’s. I also love a Vouvray, so crisp and light and the essence of summer. Like your song pairings. The Rose was very good. Provence is a great region for roses. So glad you liked song choices. Hope you are having a great week! I just started following a great wine blog called Rockin Red, and I loved this article by Michelle Williams on her summer journey into French wine! I love wine but I know very little about French wines, so this article was enlightening as well as enjoyable. I hope to see more articles from this blog on wine-related topics, but for now, vive la France! Thank you so much Sean! I’m so glad you enjoy my blog & this article. Yes, there will be more on French wine. I’ve already written 3 so please look for them in the coming weeks. We can explore together! Cheers!